Dental implants are specifically made titanium screws which are placed into the jaw bone. Once the bone has healed around the implant it is able to support single or multiple crowns. Dental implants are currently the preferred way to replace missing teeth in most situtations. The Association of Dental Implantology UK has a very thorough page on dental implants which answers almost all of the frequently asked questions. It can be found here. How long is a piece of string? Dental implants are affected by any number of factors which can shorten their life expectancy. To simplify things, as long as you are fit and healthy, do not smoke, have regular check-ups and hygienist visits, the implants should last a very long time. As with normal teeth, dental implants can become infected and lose their supporting bone, eventually becoming loose and requiring extraction. The crown/bridge which is secured on top of the dental implant does suffer from wear and tear and it would be sensible to budget for its replacement or refurbishment once every 10 years. The cost of this is much less than you would have initially paid for the dental implant treatment. Dental implant treatment is usually carried out under local anaesthesia and 99% of my patients cope well with the experience. I am able to offer IV sedation for nervous patients, which makes the whole experience much more relaxing. There is usually some post-operative pain, which can be managed with over the counter painkillers. From my experience, patients who have 1 or 2 dental implants cope very well and are in little or no pain after surgery. Patients who need a combination of multiple implants and grafting tend to be in slightly more discomfort afterwards and swell up a bit more, which soon resolves. All my implant patients receive my mobile number so I’m only a phone call away in case you have any concerns after surgery. This is a common question! I see a lot of patients who are curious as to why I am more expensive than the dentist up the road or a tourist clinic in mainland Europe. These are all fair questions and I am happy to explain why. Firstly, implant dentistry is not something that is taught in dental school, dentists do not graduate with any first hand experience in placing implants. This can be obtained through weekend/week/month long courses or through formal University education. I have completed a 2 years Masters degree from Kings College London which involved the completion of an original research thesis. The MSc in Clinical Implant Dentistry is currently the highest clinical qualification in implant dentistry available in the United Kingdom. Secondly, there are hundreds of dental implants systems available on the market today, each one with its own specific clinical tools, screwdrivers, screws etc. I mainly use the Astra Tech/Dentsply Implants System which is one of the leading dental implant manufacturers in the world. Their materials are of an exceptional quality and as a result carry a premium price. I would caution all patients to read up on the dental implant manufacturer which is used by their dentist. My worry is that if a patient has an implant placed into their mouths, manufacturered by a small company, the necessary tools or parts may be difficult to obtain in 5 or 10 years time if that company no longer exists. How long will the whole treatment take? First visit: This is where the treatment is discussed; radiographs, photos and tooth moulds are taken. If a tooth needs to be extracted first then this would be done at the next appointment and the dental implant placed immediately, or we wait 1-2 months for the site to heal and then place the implant. Second visit: Implant placement under local anaesthetic or under IV sedation (I recommend sedation if you are nervous about having implants placed). Third visit: This is 2 weeks after the implant placement to remove the sutures and to make sure you are healing correctly. Once this is done we wait a minimum of 2-5 months for the implant to integrate. Fourth visit: The implant is exposed; this is where a healing cap is placed on top of the implant in order for the gum to heal around it. Fifth visit: Impressions are taken using normal dental materials. Sixth visit: The final crown/bridge is fitted. The above is a common set of appointments to replace one single tooth. Depending on the complexity of your case you may require more or less appointments. I would go through all of this at the consultation appointment. 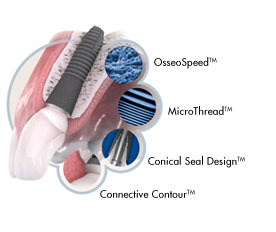 If you still have some questions regarding implant dentistry please contact me via e-mail or phone.